Footage released by the AFP news agency shows Palestinians carrying Israeli citizenship marching in solidarity with Palestinians in the West Bank. 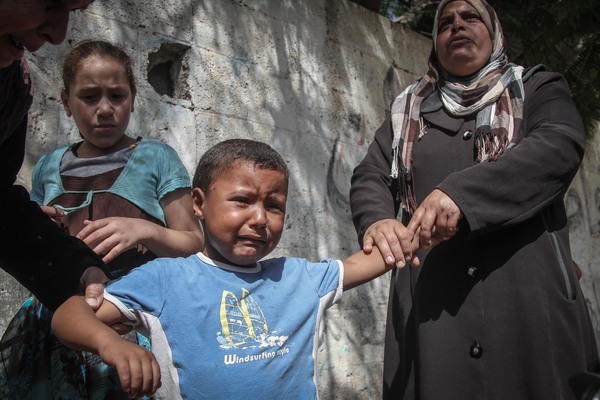 Reuters are reporting that the number of Palestinians killed in the Gaza Strip now stands at four. We'll bring you confirmation here as we get it. An Israeli army spokeswoman tells Al Jazeera that 200 Palestinians in Gaza "approached the security fence, throwing rocks and rolling burning tires at the soldiers". A video posted on Twitter purports to show clashes between Palestinian protesters and Israeli forces in the Bab al-Zawiyah area of Hebron in the occupied West Bank. Hamas leader Ismail Haniyeh has called on Palestinians to intensify clashes with Israeli forces in the occupied West Bank, including East Jerusalem. 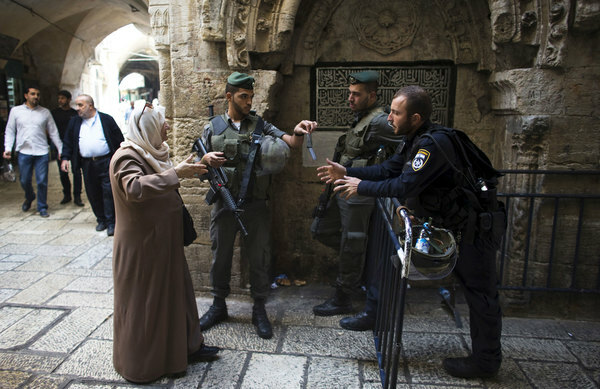 "We are calling for the strengthening and increasing of the intifada... It is the only path that will lead to liberation," Haniyeh said. For our full report, click here.
" Our people has a constant and firm rights to resist the occupation and will never give it up. Jerusalem has been and will remain the core of the core of the conflict and the core of Arab and Muslim history. The uprising in Jerusalem and the West Bank is to express the deep anger of the Palestinians, and every one should work on developing such anger and turning it into an uprising that recovers the honour of the Palestinians ." Video published by the Palestinian @ShehabAgency appears to show an Israeli jeep running over a Palestinian protester in El-Birreh, northeast of Ramallah. The youth appears to walk away without serious injuries. The images might are of a distressing nature, and viewer discretion is advised. Al Jazeera cannot verify the accuracy of the images. A source in the Qassam Brigades tells Al Jazeera that its fighters and those from Islamic Jihad have opened fire on Israeli soldiers at the Beit-Hanoun crossing, in the northern Gaza Strip. Footage has emerged on social media that appears to show the moments when Israeli security forces shot and wounded an Arab woman at a bus station in the Israeli town of Afula. Police say the woman, who wore a long robe and headscarf, had pulled out knife with the intention of stabbing a soldier. The video begins as the woman is surrounded by several members of the security forces, with their weapons pointing at her and yelling. Her right arm made downward gestures with a long shiny object that police said was a knife. At one point, a member of the security forces rushes forward, shots ring out and the woman falls to the ground. It's not clear from the footage what she was doing at the exact moment she was shot. Police said she posed an "immediate threat". Al Jazeera sources in Beit El say there are more than a thousand people protesting, and at least two people have been seriously wounded by Israeli soldiers, who are using live ammunition, rubber-coated bullets, and water canon. Beit El has witnessed previous clashes between Palestinian protesters and Israeli soldiers, and was the scene of an incident where undercover Israeli soldiers attacked protesters. 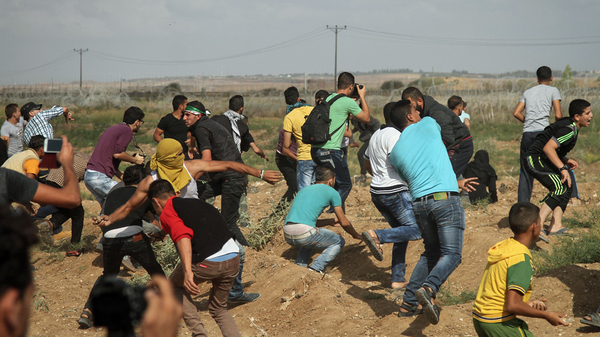 Undercover Israeli infiltrators clash with Palestinian protesters, using a weapon at close range. Israeli soldiers have killed at least six Palestinians in Gaza at today's protest in solidarity with protesters in the West Bank. Palestinian medical sources in the area said another 70 people are wounded, 10 of them seriously. 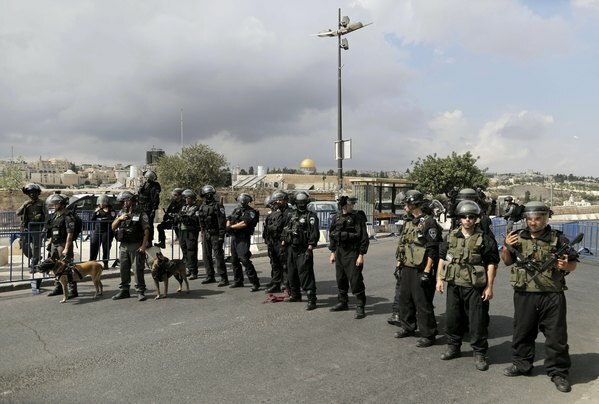 This image by Ammar Awad for Reuters shows Israeli police forming a barrier with the Al Aqsa mosque in the background. Palestinians fear far-right Israelis backed by Israel's right-wing governing coalition are attempting to partition the mosque compound between Muslims and Jews. 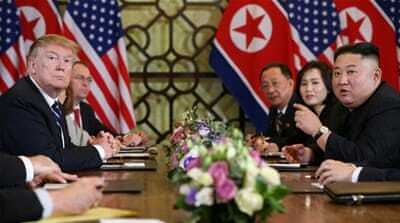 Israeli Prime Minister Benjamin Netanyahu denies that's the case and has pledged to maintain the status-quo. A video being shared on Twitter apparently shows the moment Israeli police shoot a Palestinian woman who is alleged to have participated in a stabbing attack. Photographer Muhannad Darabee, who has witnessed today's clashes has given Al Jazeera the following breakdown of casualties in the West Bank. 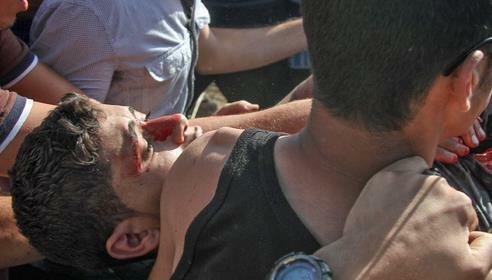 7 direct physical wounds from Israeli forces. 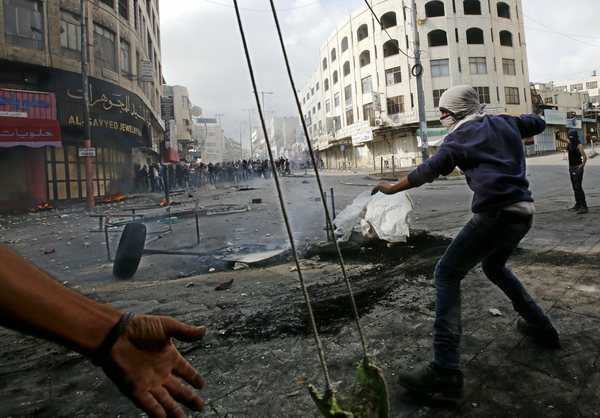 In this Reuters photo a Palestinian youth in Hebron throws a stone at Israeli troops. 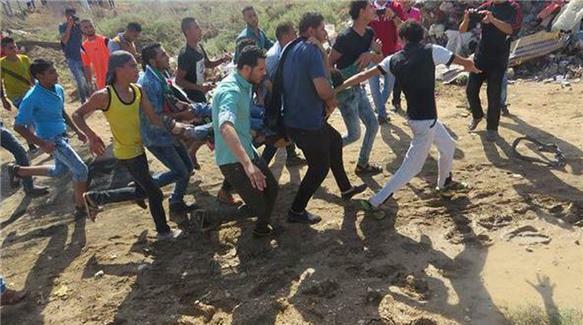 The Palestinian Ministry of Health has published on its Facebook account an updated figure for those killed and wounded by live and rubber-coated ammunition in both the West Bank, and Gaza. It says seven people have been killed by Israelis in both occupied territories, six of those in Gaza. The number of wounded in both is 141, with 80 injured by live fire in Gaza and 61 in the West Bank. The ministry says a further seven people have suffered fractures and broken bones in attacks by Israeli soldiers and settlers. 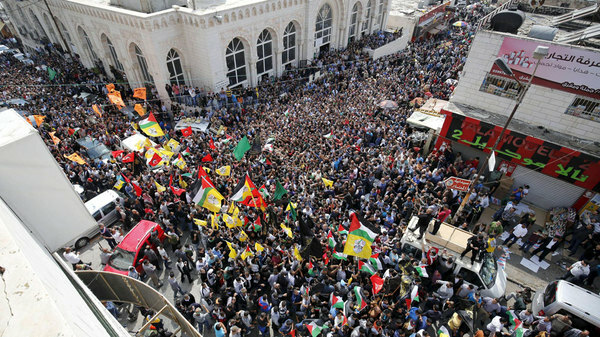 It is a mass uprising by the people who refuse to divide al-Quds (Jerusalem), this is how the people responded. 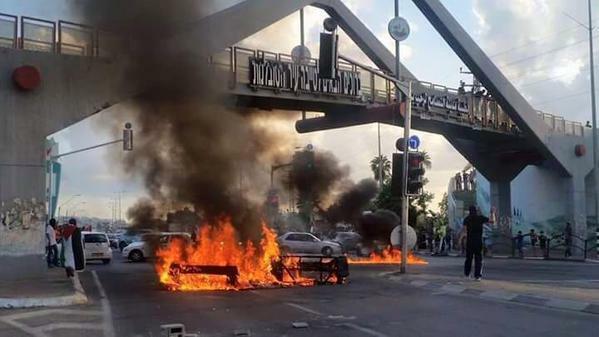 And we as a popular resistance movement call upon other factions to declare a third Intifada. The Israeli occupation aims to divide our people geographically and administratively and we note to our people their intention. Honestly the 52-day Gaza war did not worry the occupiers as much as the operations taking place in the West Bank right now. We call upon our heroic brothers in the West Bank to carry out more of these operations. What's life like for Palestinians living in Hebron in the West Bank? Ylenia Gostoli writes about a city divided between Palestinians, and Israelis living in settlments that are illegal under international law. 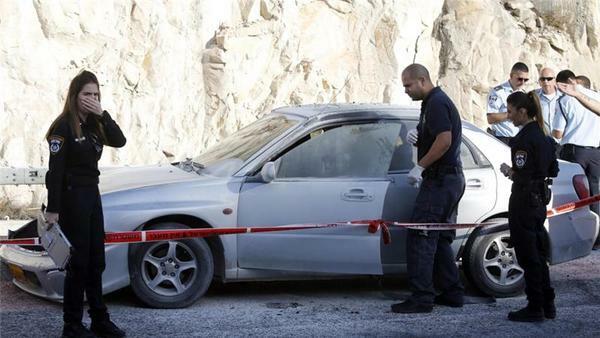 Rock throwing incident near Nablus causes car accident leaving 3 Israelis injured. An image of our times? 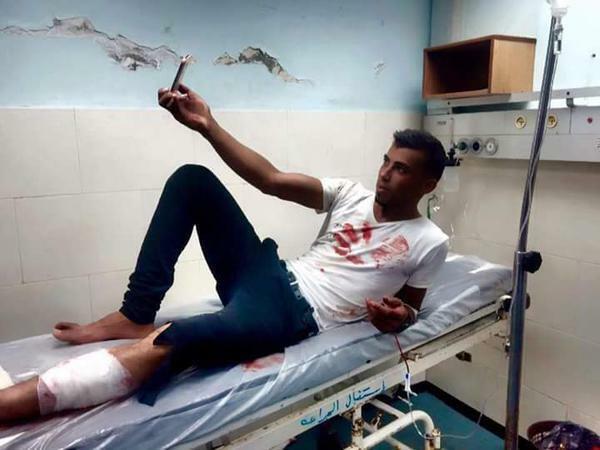 This picture shows a wounded Palestinian in Gaza taking a selfie while on a hospital stretcher apparently after today's clashes in the territory. This picture taken by Ezz Zanoun for Al Jazeera shows a Palestinian youth being carried away by other protesters in Gaza are being shot and wounded by Israeli soldiers. Another image by Ezz Zanoun from Gaza. Last month Inside Story discussed Israeli Prime Minister Benjamin Netanyahu's intentions towards the Al-Aqsa mosque. The fate of the mosque is a key source of worry for Palestinians who believe Israeli ultra-nationalists intend to partition the site with the support of their government. Netanyahu says he is committed to maintaining the status quo. 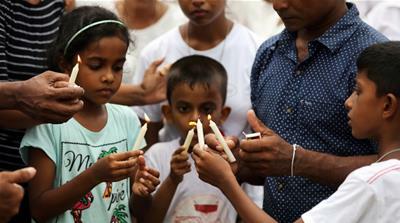 The US regards a recent spate of stabbings and shootings of Israelis by Palestinians as "acts of terror," the State Department said Friday. But spokesman John Kirby would not be drawn on whether an apparent revenge attack by a Jewish suspect that wounded two Palestinians and two Israeli Arabs was also terrorism. "We would consider these violent acts that we're talking about specifically here as acts of terror," Kirby said, answering a question about the wave of violence. "The stabbings, the shootings, terrorism, yes." "I don't have the details on that, so I'd really rather not get into this event by event," he said. We've curated a series of photos depicting what is happening in occupied East Jerusalem and the West Bank. You can view more here. 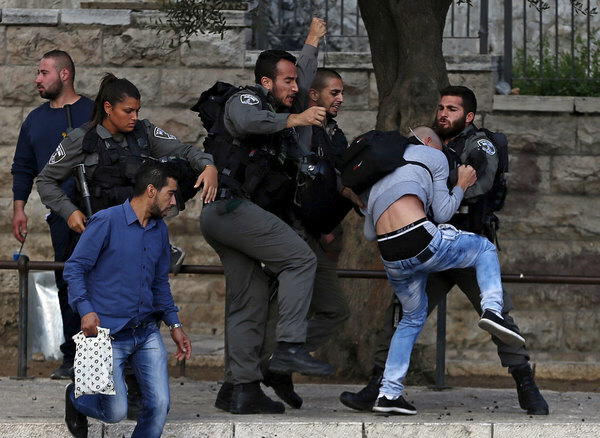 Israeli police kill a Palestinian in clashes in East Jerusalem, the AFP news agency, citing officials, reported. On Sunday morning, 17-year-old Abdullah Hassan arrived at his relatives' home to find it had been struck in an Israeli airstrike. The bombing killed his pregnant aunt, Nour Hassan, and her two-year-old daughter Rahaf. The Israeli military later said in a statement that it had targeted "two Hamas weapon manufacturing facilities in the northern Gaza Strip". Relatives of the deceased say there were only civilians in the home. 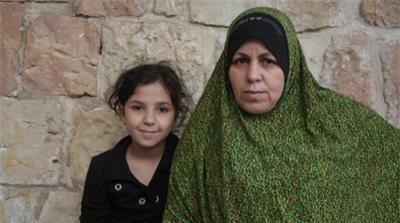 "They had all been asleep when the [Israeli military] targeted the house. They were sleeping. 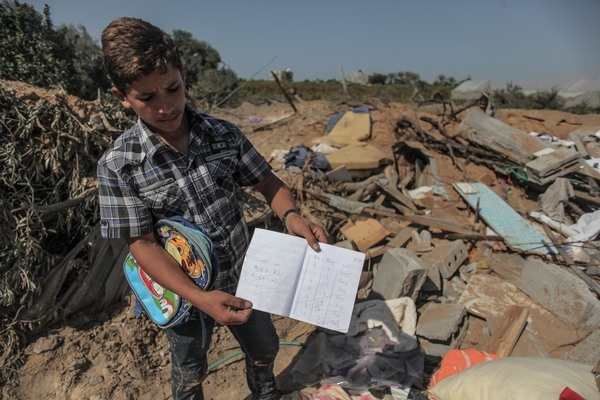 There was no reason or excuse for [Israel] to target this home. They aren't fighters. There aren't rockets there." "My dad, my brother and I arrived to find the house bombed. We couldn't see anyone, but I heard a voice. We got my uncle and my cousin out from under the concrete - he was injured badly and crying for his mom." "We were digging through the rubble for two hours before we found his mom - my aunt - and the little baby. They were dead." Israeli forces have raided a Palestinian media organisation's office in the occupied West Bank as rights groups voice criticism over what they call growing press violations, particularly during clashes and demonstrations. Around 4am local time on Sunday, Israeli soldiers used crowbars to break down the door of the International Middle East Media Centre's headquarters in Bethlehem, a Palestinian city in the central West Bank. The incident was captured on tape. Speaking to Al Jazeera, Alexandra Halaby, a senior contributing editor at IMEMC, said that the soldiers "ransacked our office, breaking down the door and proceeding to throw computers on the ground". "We are dumbfounded by the raid on our office," Halaby said. "There was no excuse given, no reason given." An Israeli army spokesperson was not immediately available for comment. "Because we're an independent news organisation, we don’t have a lot of funds. Now we’re forced to pay for our destroyed office and computers and finding funds." “It was clearly intentional because they did it before," she said, adding that the group's office was raided in 2002, during the Second Intifada. During the first week of October, Israeli forces were accused of committing at least seven press violations, including striking a journalist with live ammunition. "Israeli occupation forces are both directly and indirectly targeting journalists," Mousa Rimawi, director of the Palestinian Centre for Development and Media Freedoms, told Al Jazeera last week. The Palestinian Authority Ministry of Health has confirmed the death of 13-year-old Ahmad Abdullah, who was shot by Israeli forces with live ammunition during clashes outside of the Beit El settlement near Ramallah. رام الله- أعلنت وزارة الصحة استشهاد طفل (13 عاما) وإصابة أكثر من 75 مواطناً بالرصاص الحي خلال المواجهات التي دارت في رام الله ونابلس وطولكرم، منذ صباح اليوم الأحد. وأضافت الوزارة في بيان صحفي، ظهر اليوم الأحد، أن الطفل أحمد عبد الله شراكة (13 عاما) وصل مجمع فلسطين الطبي برام الله بعد إصابته برصاصة مطاطية بالرأس، وأعلن عن استشهاده متأثراً بجراحه، حيث عانى من نزيف على الدماغ. وباستشهاد الطفل، يرتفع عدد الأطفال الشهداء منذ بداية أكتوبر إلى 8، ففي قطاع غزة استشهد الأطفال: محمد هشام الرقب (15 عامًا)، مروان هشام بربخ (13 عاما)، خليل عمر عثمان (15 عاما)، والطفلة رهف يحي حسان (عامان). وفي الضفة الغربية استشهد 4 أطفال هم: الطفل أمجد حاتم الجندي (17 عاما)، الطفل عبدالرحمن عبيدالله (11 عاما)، والطفل اسحاق بدران (16 عاما)، واحمد عبد الله شراكة (13 عاما). ويرتفع بذلك عدد الشهداء منذ الأول من أكتوبر إلى 24 شهيداً 13 منهم في الضفة والقدس، و11 في قطاع غزة، إضافة إلى أكثر من 1300 مصابا بالرصاص الحي والمطاطي. وأصيب 8 مواطنين برام الله، وأدخلوا مجمع فلسطين الطبي، منهم إصابة بالرصاص الحي و3 إصابات بالرصاص المطاطي و4 إصابات بالاختناق. وعلى حاجز حوارة جنوب نابلس، أصيب 53 مواطنا بالرصاص الحي، أدخل منهم 32 إلى مستشفى رفيديا، وقد حولت إحدى الإصابات إلى مستشفى النجاح الوطني، فيما وصل مستشفى الاتحاد 5 إصابات بالرصاص الحي. أما مستشفى نابلس التخصصي فوصلته 7 إصابات بالرصاص الحي، وقد أدخل مستشفى العربي التخصصي 9 إصابات بالرصاص الحي. وفي طولكرم أصيب 20 مواطنا بالرصاص الحي والدمدم في الأطراف السفلية، حولوا إلى مستشفى طولكرم الحكومي ومستشفى الزكاة بالمدينة. 24- الطفلة رهف يحي حسان (عاما). A Palestinian teenager has been shot dead by Israeli forces during a clash at a checkpoint north of the occupied West Bank city of Ramallah, the Palestinian health ministry has said. Ramallah Government Hospital director Ahmed Bitawi told Associated Press that Ahmad Sharaka was shot dead by three live bullets to the head, neck and chest. It identified the fatality as 13-year-old Ahmad Sharake and said approximately 20 Palestinians were wounded by rubber bullets in the same clash near the Jewish settlement of Beit El. Speaking to Al Jazeera, an official at Ramallah Hospital said that 13-year-old Ahmad Sharaka died after being shot in the neck with live ammunition by Israeli army forces in clashes near the Beit El settlement. "Unfortunately his wounds were so severe that he could not make it and he died despite all of the medical procedures," the official said. Israeli police have said that a Palestinian woman set off a "gas canister" in an alleged attack on officers at a checkpoint in occupied East Jerusalem. 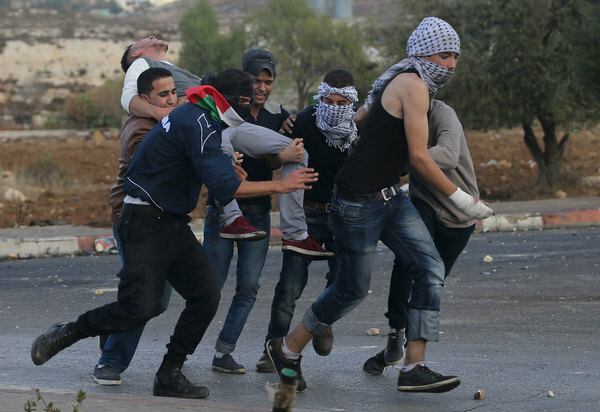 Local media: Palestinian citizens of Israel clash with Israeli police in the villages in the Galilee region of the country, including Abu Snan. Local media: Israelis marching in streets of Tel Aviv and Hadera following a stabbing attack that injured four Israelis in Hadera. Police say the suspect is a Palestinian citizen of Israel who rammed a vehicle into the victims before stabbing them. Israeli army: Rocket fired from Gaza has landed in an empty field in southern Israel.